Contact Kinzler for hassle-free delivery of Danback Flexible Wood Backing! Installing blocking for cabinets, fixtures, and railings is one of the slowest parts of framing walls with lightgauge steel, but Danback Wood Backing Plates can speed things up! 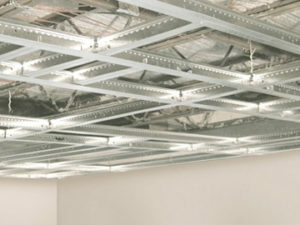 Pre-cut and fire-treated, the plates are suitable for commercial spaces and fire-rated assemblies. Contact Kinzler for hassle-free material delivery! When projects demand a higher level of acoustic performance as well as visual appeal, CertainTeed Ceilings Ecophon products are the right ceiling for specifiers and contractors alike. 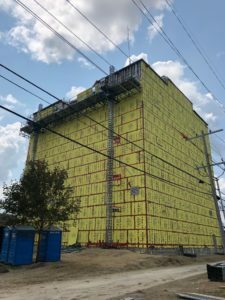 Lightweight and resilient, high-density fiberglass panels deliver superior performance and ease of handling in any form – from frameless free-hanging clouds to concealed grid systems to direct-to-deck panels. 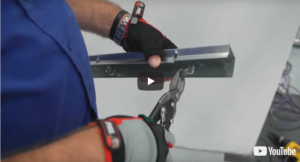 We have a full series of special how-to videos to answer your most frequently asked installation questions for Ecophon products. Watch now. When a tornado ripped through Marshalltown last July, it took with it the roof and many walls of the building home to RACOM. The company controls the network for most of Iowa’s first responder radio communications. The entire building envelope had to be replaced, but the office couldn’t shut down operations during demo or reconstruction. Getting the building weather tight as quickly as possible was a top priority! Kinzler Construction Services’ Distribution Division delivered 30,000 sq. ft of Dens Element sheathing. This was the perfect product for this tight timeframe because it eliminates the need for an external WRB-AB! 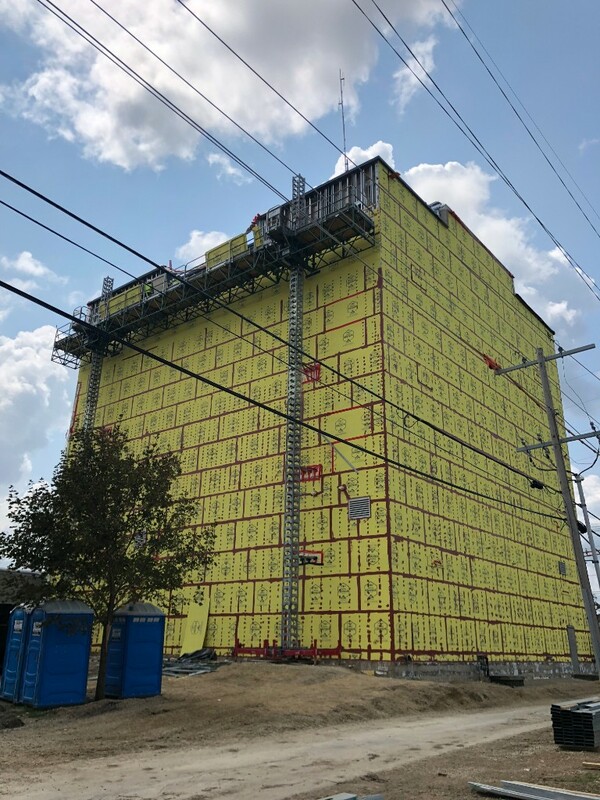 Learn more about how you can finish your project faster, safer and smarter with Dens Element Barrier System! Learn more about the beneifts of StudRite in this short video. Kinzler Construction Services is committed to bring your preferred material supplier. StudRite weighs less than traditional studs, which makes it easier to handle. The unique design is more user-friendly and requires less time to get the job done right. The versatility of StudRite wall systems means increased efficiencies, making it the best tool for the trade. Increased structural performance due to lip reinforced repetitive triangular cutouts and embossments. Improved thermal, fire & acoustic ratings. Efficient design for installing plumbing, heating, electrical & other trades. Saves YOU valuable time & reduces labor costs. Contact us today to discuss Kinzler Construction Services delivering StudRite to your jobsite! 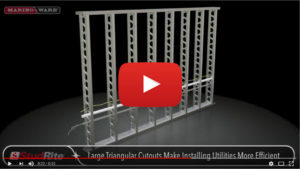 The Drywall Grid System That Just Clicks! 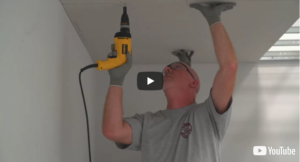 You will frame dropped drywall ceilings faster with Certainteed Quickspan and enjoy a 33% labor savings! Faster Layout: Track has locking tabs every 8” O.C. for maximum flexibility and speed. Less Screws: Twist the cross tees in the locking tabs and done. Longest unsupported spans in the business: Span 8’ 2” at 24” O.C. with no wires using 60 Minute Type X = 1.9 LBS./SF. QUICKSPAN CASE STUDY: Beating the Clock – with Quality, Efficiency and 10x Faster Installation >> Read More.